Conduit knockouts on the bottom and top with filler pieces to fill conduit cutouts when no exposed conduit to mount over. The STI-3100 is a 2" conduit spacer with 1/2" conduit entry (no gaskets included). 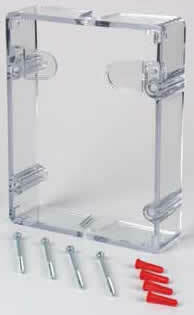 The clear conduit spacer adds two inches of depth to the Stopper II and Weather Stopper series products. It has conduit knockouts on the bottom and top with filler pieces to fill conduit cutouts when no exposed conduit to mount over. The STI-3100 is a clear conduit spacer adds two inches of depth to the Stopper II products.